Join the discussion on our forums! Come discuss Celestial Emissary over in our dedicated Celestial Emissary discussion topic. Battlecry: Your next spell_this turn has Spell_Damage +2. This card must be a reference to Star Trek: Deep Space 9. Sisko was seen as the emissary to the prophets, which lived in a wormhole, but the locals saw that as a heaven or celestial place. And the flavor text here says "casting with the stars." And Sisko did cast with the stars or so to speak was one of the stars of the show that were cast! Can be decent in the future but I don't think it's great now. There's not that many cheap spells that really care about spell power that'll warent an almost 2 mana understated minion card. I think this is good in big spell mage ..
Blizzard 4 damage, meteor 17 + 5 damage .. plus ping jaina. But this unit doesn't have a spelldamage keyword. It has a battlecry that affects spell damage. I guess, it will see play. It’s like a 2-mana +2-attack buff to Fireball or Frostbolt that you can fire into the opponent face avoiding taunts. Pretty nice for Tempo-Mages. Pretty annoying for any opponent. Ooh! This is the kind of spell damage synergy I want to see for Mage. It doesn't require you to play an awkwardly statted minion and it's cheap enough to combo into a bunch of smaller spells to make it easier to take out bigger targets. Arcane Missiles and Frostbolt become more powerful and reliable and Blizzard turns into a freezingFlamestrike. This is a really useful card. This with Freezing Potion. Insane ! You might have something memeingful actually. Adjusting the formula for Arcane Blast I just posted earlier for Ice Lance and Freezing Potion it could go like this after 1 Emperor Thaurissan tick. Freezing Potion face+Brann Bronzebeard(2)+double Celestial Emissary(1+1)+double Tuskarr Fisherman(1+1)+double Ancient Mage(2+2)+double Ice Lance(0)=10 mana=4+4+2+2+2+2+2+2+2+2+2+2= 28 spell damage. Could be cool with Arcane Blast in wild as removal. Realistically maxes out with 1 Emperor Thaurissan tick. Brann Bronzebeard(2)+double Celestial Emissary(1+1)+double Tuskarr Fisherman(1+1)+double Ancient Mage (2+2)+Arcane Blast(0)=10 mana=2+(2+2+2+2+2+2+2+2+2+2)*2 spell damage=42 spell damage Arcane Blast. Overkill tho lol. And overkill is a bad thing? Especially on a Wrathguard? 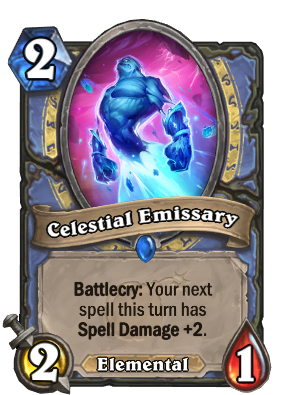 Very good card and also reasonable in how they implemented the +2 spell damage. 4 mana is pretty much Hellfire but only affects the opponent's side while you also develop a 2/1. With 9 mana, you could deal 15 damage if used along with Greater Arcane Missiles since the damage would be multiplicative. And it interacts well with Unexpected Results for two 4 mana cards and a 2/1 body. 9 stat vanilla for 4 mana which brings it to potentially 21 stats on turn 6 which is very strong tempo. TL;DR: This card has many uses with reasonable mana cost even if it only affects a single spell. Only downside is the 2/1 stat which makes it not ideal on curve.